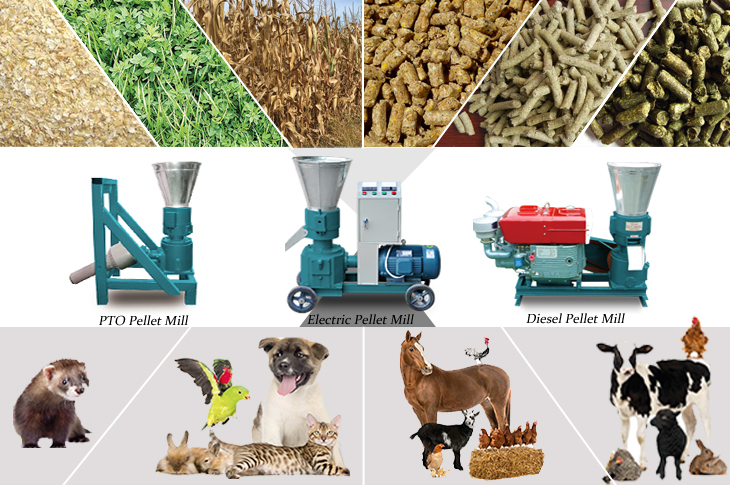 Small feed pellet machine is designed to process feed pellet for poultry animals including cattle, sheep, goat, chicken, fish etc. with the features of covering a small area, small consumption, high production capacity and stable performance. It turns out that using feed pellet is more helpful for the livestock animals like cattle, sheep, goat, chicken, fish etc. to digest and absorb the nutrition. 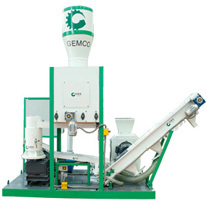 GEMCO small feed pellet machine adopts the structure of screw adjusting the pressure in center, the gap between the pelleting dies can be adjusted for larger and smaller, ensuring the pressing effect. According to the situations of clients from different countries and regions, GEMCO designs the small feed pellet machine with different driving power. Electric type feed pellet machine can be used in the places as soon as there is enough electricity; diesel feed pellet machine is mainly used in the area where lacks of electricity or the power cost is high; PTO, namely tractor driving type, is suitable for remote outdoor area where has no electricity. 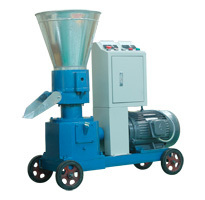 Why use small feed pellet machine? Feed pellet is produced with balanced nutrition ratio, avoiding the animals being picky, enhancing the appetite of animals. Pellet feed is easy to store for longer time and transport. Small feed mill machine produce the feed pellet in high temperature and high pressure, killing the bacteria and parasites, meanwhile the full-bodied scent is rich, improving the adaptation of the feed, easy to digest and absorb with the nutrition absorption conversion rate increasing by 300%. Small scale feed pellet machine has small volume, light weight, wide adaptation, convenient to move it to anywhere that you want. And it has low threshold with low investment price, very suitable for small feed pellet production by the beginners of the industry or the users who has not so much money. We possess our own feed pellet machine factory and this type animal feed pellet machine is one newly designed energy-efficient equipment by our company through the unremitting efforts of R&D team and many technical experts. Adopting the international advanced technology, feeding the raw material in the way of dry-in and dry-out, the feed pellet machine can produce the perfectly shaped feed pellet at one time for the factory price. How to make high quality cattle feeds? We usually name the machine according to the application of finished product, for instance, the feed pellet machine used for making cattle feed is also called cattle feed pellet machine. For making high quality cattle feeds, you have some tips to consider. For making high quality cattle feed pellet, raw material is the most important. You should collect the raw material according to the type of the cattle, because different kinds of cattle requires different nutrition, even the different age of the same cattle have different requirements. In many times, making cattle feed pellet needs not only one kind of raw material. After collecting the necessary raw materials, you should prepare the raw materials very well. Cattle feed pellet machine requires the raw material strictly, one is the raw material moisture content should be kept within 12%-15%, and the size should be crushed into 3mm below. Choosing one suitable cattle feed pellet machine with high quality is also an important matter for making high quality. A high quality cattle feed pellet machine can make the feed pellet with higher density, brighter surface, higher curving degree, which can enhance the appetite of animals. Suitable feed mill machine for meeting your raw materials situation and requirements can help you to make the production more successful.